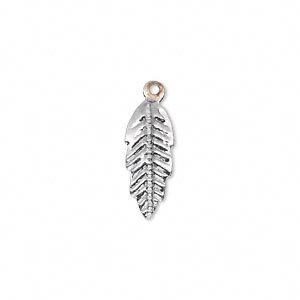 Drop, silver-plated brass, 20x7mm double-sided feather. Sold per pkg of 6. Item Number: H20-3411FX Have a question about this item? 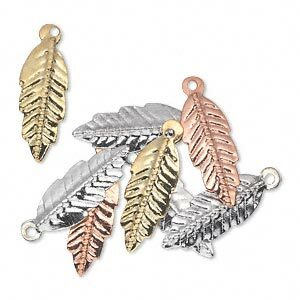 Drop, silver- / gold- / copper-finished brass, 20x7mm double-sided feather. Sold per pkg of 8. Drop, brass, bright purple patina, Pantone® color 18-3520, 20x7mm double-sided feather. Sold per pkg of 6. Drop, brass, earth tone brown patina, Pantone® color 19-1321, 20x7mm double-sided feather. Sold per pkg of 6. Drop, brass, bright gold patina, Pantone® color 18-0935, 20x7mm double-sided feather. Sold per pkg of 6. Drop, brass, jewel tone black patina, Pantone® color 19-0508, 20x7mm double-sided feather. Sold per pkg of 6. Drop, brass, jewel tone red patina, Pantone® color 19-1543, 20x7mm double-sided feather. Sold per pkg of 6. 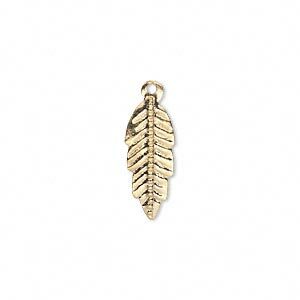 Drop, gold-finished brass, 20x7mm double-sided feather. Sold per pkg of 6.